Plug in an electrical device into the Westek 100-Watt Indoor Plug-In Motion-Activated Light Control to have it turn on when movement is detected. 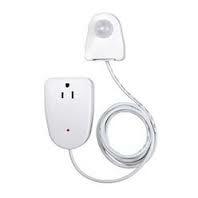 Great for turning on lights in the dark, this light control offers a 6 ft. cord to provide extra reach from the wall outlet. With a 25 ft. range, this light control can sense motion easily across large rooms and long hallways.